Madison Lukaczyk wanted to improve her focus by controlling her distractions. She had already blocked distracting web sites, but what about work related channels that nonetheless constantly interrupted her concentration? 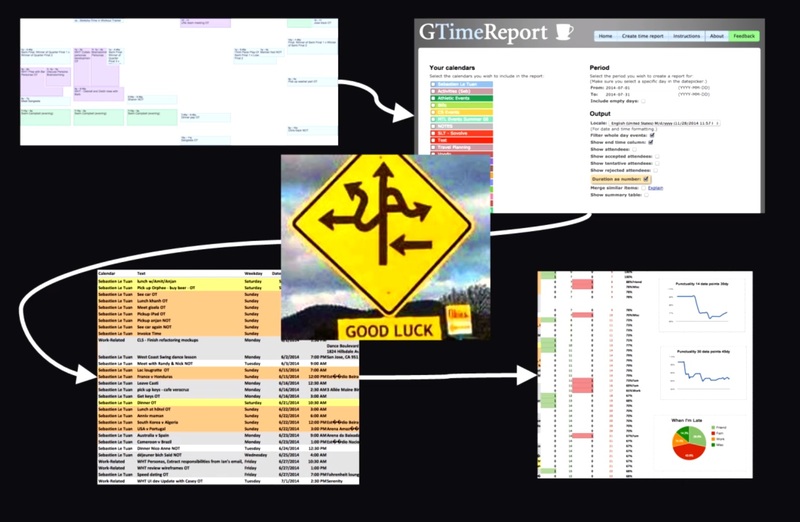 Using time-tracking data from RescueTime, exported to R Studio, she created visualizations that revealed how her workflow was affected by chat threads, emails, and texts. Michael Lim, teacher, and Alex Truong, 12th grader, redesigned the AP Statistics course at Summit Shasta High School to have students learn by analyzing their self-tracking data. They prepared by doing their own QS project with Rescuetime, MyFitnessPal, multivariate regression, and more. How much work does it take to get a PhD? 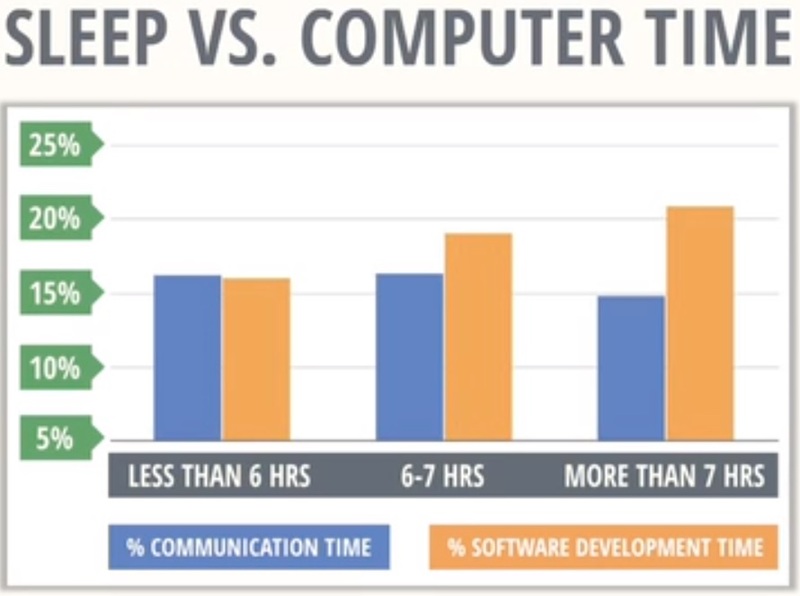 How do marathon work sessions affect future productivity? 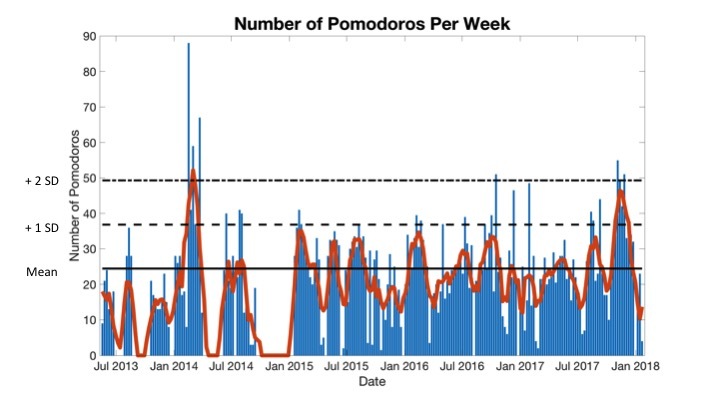 Maggie Delano will answer these questions and more using data from tracking over 5000 pomodoros over the course of earning her PhD. Daniel Reeves has made it a strict personal rule that every time he utters a statement starting with "I will" to someone, no matter how casually, he logs the commitment, with a due date, and keeps track of when he follows through. For years, Eli Ricker has tracked her self-created "Life Satisfaction" score and whether or not she did what she said she would. She’ll describe what this practice taught her about effective goal setting, true productivity, and deeper satisfaction. 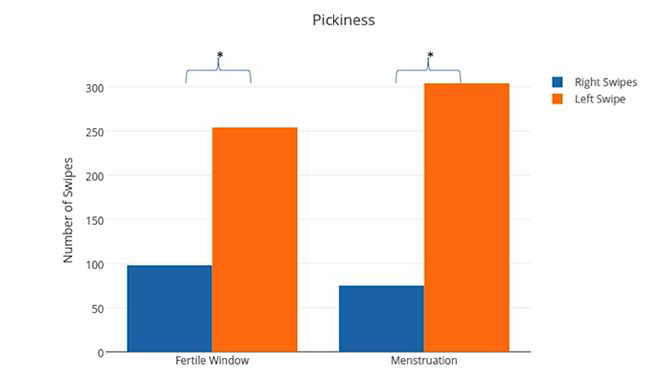 Ahnjili Zhuparris came across a study on the menstrual cycle’s influence on cognition and emotion and was curious to see how hormonal changes may affect her day-to-day behavior. She figured her internet use may be a convenient and easy data set to assemble and examine for this effect. Using a few chrome plugins, Ahnjili was able to see not only where she spent her time online, but how she interacted with sites like Facebook and Youtube. Her analysis yielded some interesting patterns. In this talk, Ahnjili shows the differences in how she browsed Facebook, swiped in Tinder, and listened to music on YouTube. In August of 2014, Valerie Lanard committed to quitting TV and focused on how her environment and triggers reinforced a behavior she felt “locked into.” In this talk, she discusses her fascinating project to quit TV for thirty days. She shares the process, what ended up replacing all of her TV time, and lessons she learned about herself when she was able to break the habit. Before moving to Tennessee from Seattle, Robby Macdonnell did not even own a car so driving was a new feeling for him. He started transportation logging and time-tracking after realizing that he was spending more than an hour a day driving. He wanted to have some bragging rights about how he is not as bad as other people when it comes to being a distracted driver. He combined two data streams, using Automatic and RescueTime, to prove that he does not use his phone while driving nearly as often as other drivers. Only the data didn’t agree. 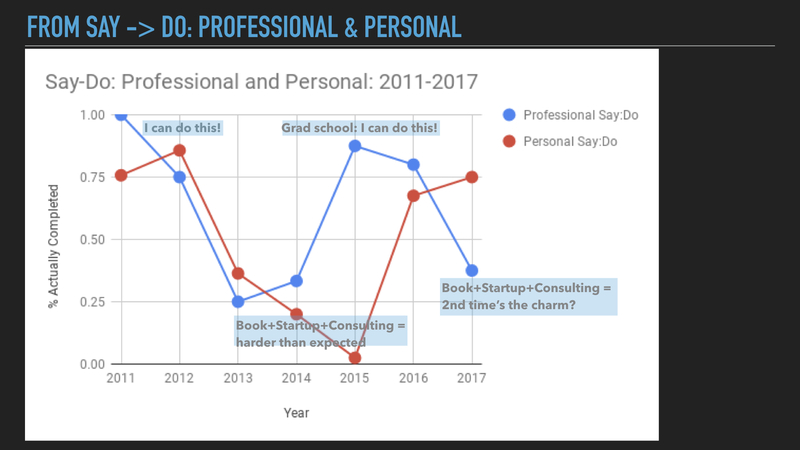 Kyrill Potapov was curious about his work and life balance and wanted to see how much time he was spending on personal growth compared to work. 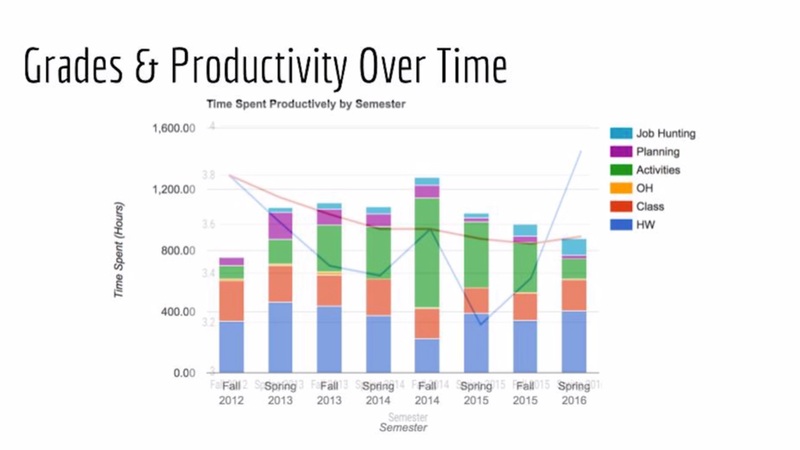 In order to do his experiment, he hacked RescueTime to track how he uses his computer to make it a tool for personal growth, rather than work optimization. In this video, he discusses how he hacked RescueTime to actually grow a plant based on time spent on personal growth in order to find deeper meaning in his productivity and ultimately his life. Stephen Cartwright has been tracking his family member's location for years. He tracks where they are everyday of the year. Stephen then makes glass, plastic, and resin sculptures that capture the beauty of the self-recorded data. 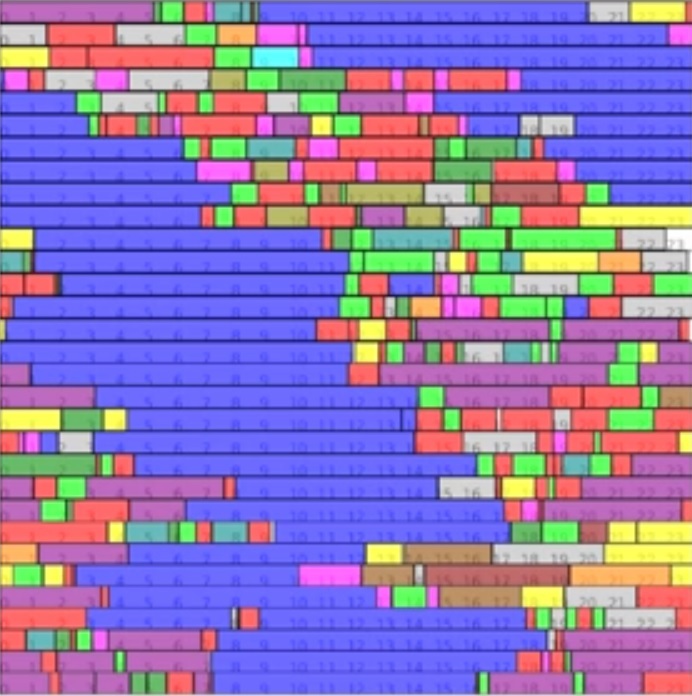 The sculptures float in the air or are captured in clear blocks to reveal intersections and correlation of the data. In this video, Stephen shares how he does his work and what he learns from the process. Matt Manhattan started tracking absolutely every physical possession he has in his life. In this video, he talks about his obsession with keeping a visual and textual diary of everything he owns. He pulled everything out from all of his drawers and cabinets and started an inventory list and made it public. Through this process, Matt shares how his life focus has shifted by taking deep inventory on material items. In this video, Stephen talks about the place of cyclical time and different ways of thinking and representing time and self tracking. 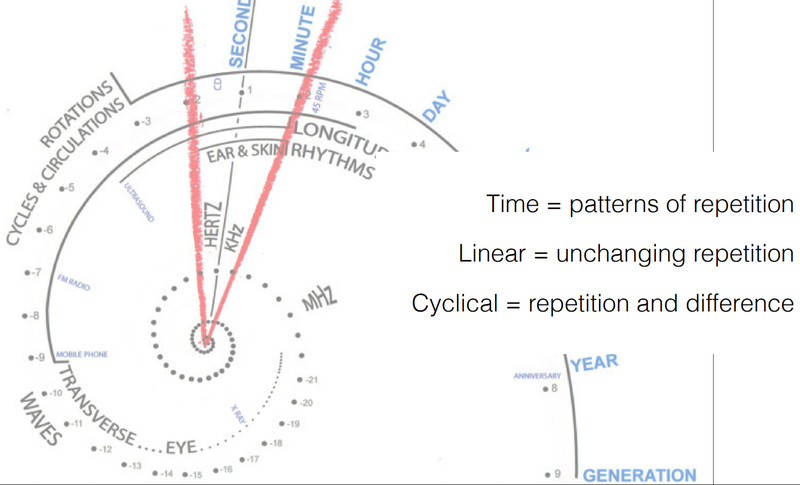 He discusses how it is possible to self-track cyclical time. He talks about the Marxist philosopher, Henry Lefebvre, to outline the means and the methods towards comprehending what shapes our experience of time. He also talks about his theory of rhythm analysis as outlined in the posthumous published rhythm analysis and space-time in everyday life. He hopes that the concept of felt routines is very integral to that theory. Six years ago while at a pub with a group of friends, David de Souza decided he wanted to run a marathon on every single continent. He made it his New Year's resolution, but completely failed. So then he decided to be proactive about this goal and started to track his runs. In this video, he discusses how recording his runs helped him understand which days he was motivated to run, what the distance was, and how many miles he ran. 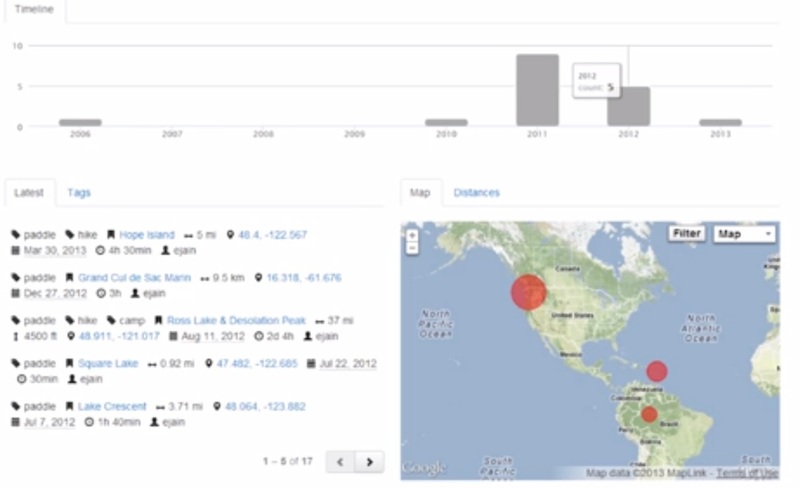 Tracking helped him run his first ever marathon in New York City, which led to the development of a dashboard he created to help keep him on track for his earlier goal, in addition to other goals in his life, as well. In 2015, Joost Plattel was very bad at keeping his phone with him at all times, so he started to track his phone use for a year with Moments. Our phones can store data on many things including how much we use them. 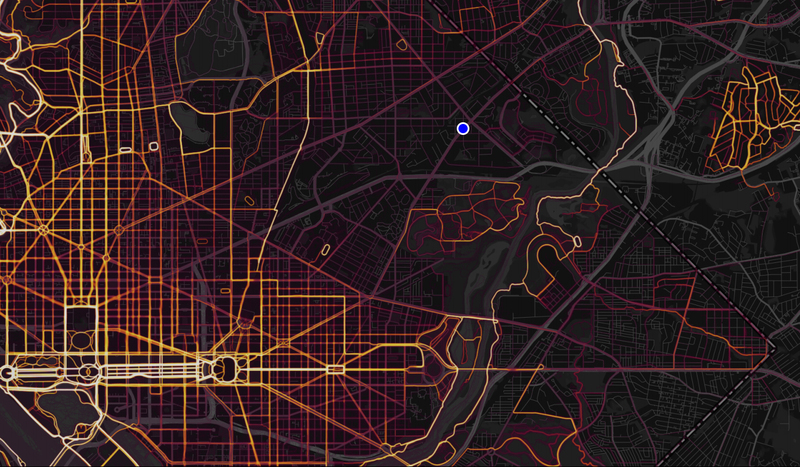 In this video, he shares what he learned from his phone use data. John Cottingim is 35 years old. He lives in New York City and manages a process automation team. In this video, John discusses how he learned to track, measure, and predict his daily satisfaction by combining automation, visualization and machine learning without any coding. Lee Rogers is a total data nerd who has collected a few hundred thousand data points over many years. He aggregates his data using various online services. In this video, he shares his lessons learned from his goal dashboarding and annual reporting experiments. Tahl Milburn presents LIAM, a life automation system he created. It's a system that gives him a 360 view of his life and its automatic system. He focuses on 9 elements that keep someone happy: physical, mental, spiritual, assets, vocation, interests, experiences, relationships, community. There's no logging, but occasional data correction. He talks about his data and what he has learned about himself using LIAM. Maggie Delano hit her head while helping a friend move. She was diagnosed with a concussion and, later, post-concussion syndrome last September. In order for her to heal, she had to give her brain a break from cognitively stimulating activities. In this talk, Maggie discusses how she tracked her progress toward recovery with Habit RPG (recently renamed Habitica) and improved her sleep with Sleepio. Shannon has been collecting data on her diet and excercise since high school. 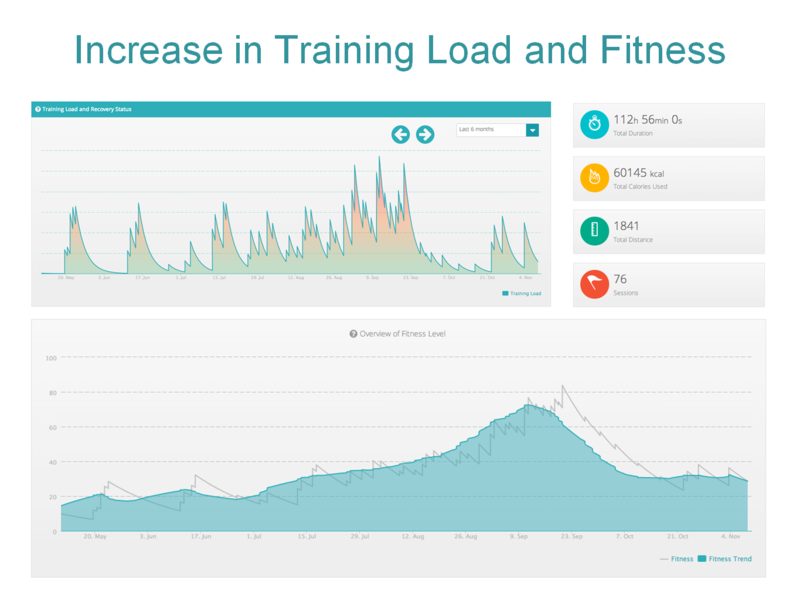 In this talk, Shannon discusses how how creating some beautiful graphs using Jump of her diet and fitness data has really helped her to understand her past patterns. It also helped her identify some habits that she really needs to change. Bethany Soule is the co-founder of Beeminder, a commitment tool which she characterizes as “goal-tracking with teeth.” She and Daniel Reeves, the other founder, has spoken on how they tracked the development of the tool and integration it with other QS tools. In this talk, Bethany shares how she was inspired by Nick Winter’s “Maniac Week“, to focus solely on working and sleeping while documenting a person's face and screen with a time-lapse video for a week. She shares what she learned from it--the accomplishments, the failures and the side effects of the project. In 2007, Mark Leavitt found out at 57 that he had heart disease, like his father, uncle, and grandfather. In this talk, he shares how he uses data to hack his habits and what he learned from the experiment. 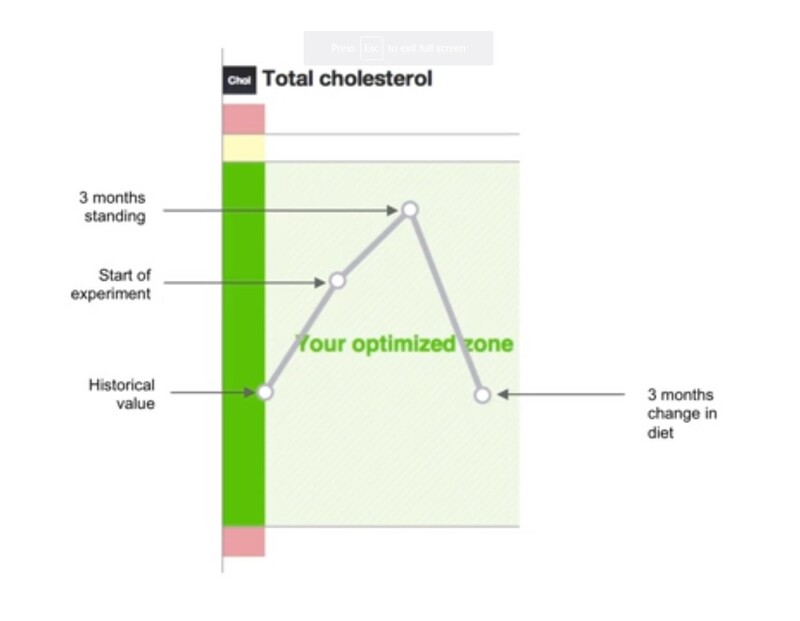 The results of his data helped him change a majority of his lifestyle habits. Debbie Chaves is a science and research librarian at Wilfred Laurier University and was interested in understanding her job and the various demands placed on her time. Using methods she employed previously she set about tracking different aspects of her work. The data she gathered allowed her to advocate for new changes and policies within her library. In this video, Debbie explains her tracking, what she found, and what she was able to accomplish. Steve Dean is the co-organizer of New York City QS meetup group. He is an avid self-tracker, using different methods and tools to understand his life. About three years ago Steve started to experience inflammation along his eyelids. He was diagnosed with atopic dermatitis and was prescribed a treatment regiment. He created a Google Form to track his symptoms and treatments he was doing every day. In this talk, Steve shares what he learned and how tracking finally helped him understand how to get everything under control. 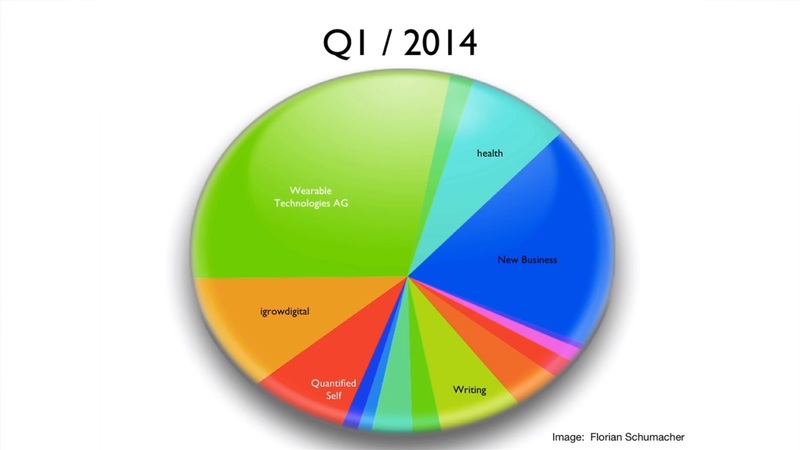 In the beginning of 2014 Florian set himself twelve goals, one for every month. In his Show&Tell he’ll present the achievements in nutrition, fitness, sleep, and productivity that he's made in 2014. Brian has been thinking about his productivity since 2011. He tried a few different methods, but he’s found that using the pomodoro technique has been very helpful in understanding and improving his work. 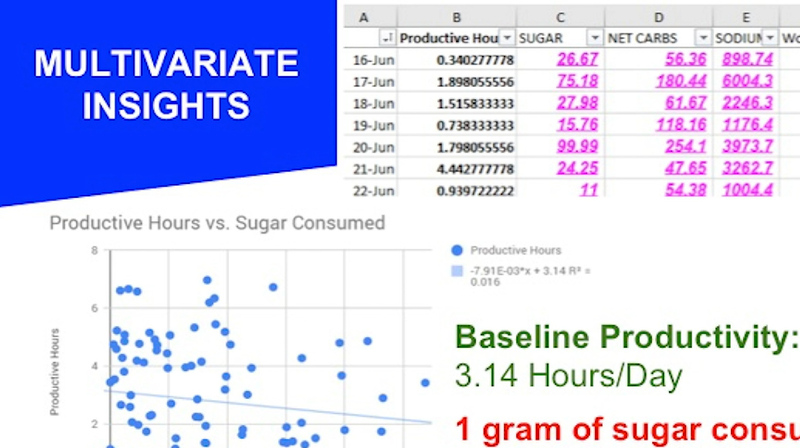 Watch his talk to learn what he found by tracking the number of pomodoros he completes each day and what new methods he’s using to make sure he gets things done. 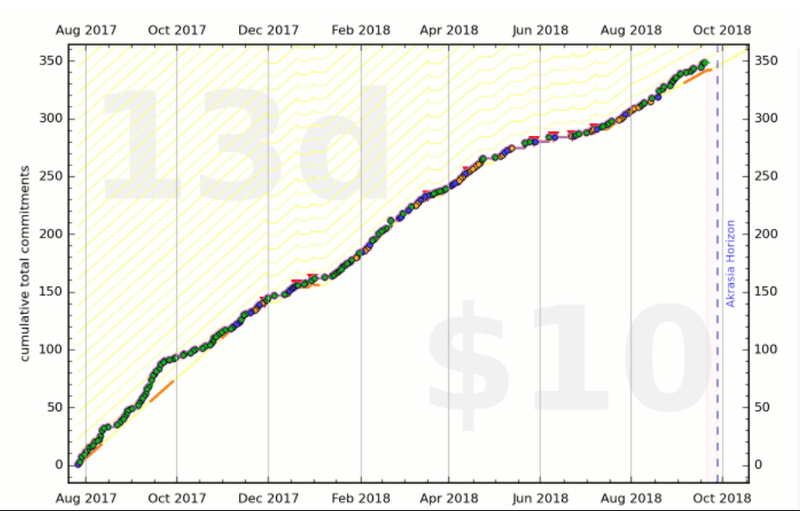 For the last six years Robby Macdonnell has been tracking his productivity and how he spends his time on his various computers (home and work) and even how he uses phone. Over those years he’s amassed 8,300 hours of screen time. Watch his great talk to hear what’s he learned about his work habits, productivity and how he’s come to think about time. Mark Wislon notices that his inbox correlates directly with his stress level. After passively tracking this for three years, he decides to actively shift how he sees his inbox account and learns how he's controlled (and been controlled by) this stream of angst. He also discovers a very important life lesson: he's addicted to email. Jenny Tillotson is a researcher and fashion designer who is currently exploring how scent plays a role in emotion and psychological states. As someone living with bipolar disorder, she’s been acutely aware of what affects her own emotions states and has been exploring different methods to track them. 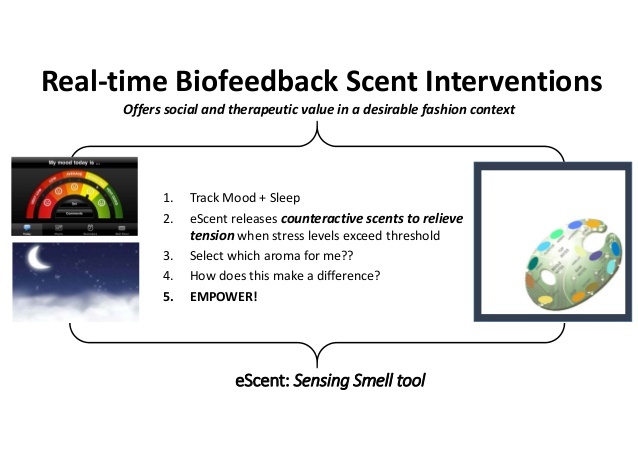 In this talk, presented at the 2014 Quantified Self Europe Conference, Jenny discusses her new project, Sensory Fashion, that uses wearable tracking technology and scent and sensory science to improve wellbeing. Like anyone who has ever been bombarded with magazine headlines in a grocery store checkout line, Kouris Kalligas had a few assumptions about how to reduce his weight and improve his sleep. But data from his wireless scale, diet tracking application, activity tracking devices, and sleep app revealed surprising results. Damien Catani had a well-rounded life with sports, arts, and intellectual activities, but started to lose his balance when he started working at a bank. So he started a spreadsheet to track his life goals, which had became part of how he manages his life. In this talk, he presents Goalmap, a digital goal setting and goal tracking platform that helps you set, track, and reach all types of goal in all fields of life from conception to completion. Dawn Nafus, an anthropologist, reflects on some observations of what self-trackers actually do when they make sense of data. Dawn's observations led her to ask: what tools might support more diverse ways of working with data? This short talk describes what she's learned while engaging and building tools for the QS community. At the QS Bay Area Meetup #40, Tiffany Qi shares four years of data that shows how she spent her time at UC Berkeley. She asks important questions about productivity, performance and searches for any correlation between time spent and its impact on her success at UCB. She also comes to some conclusions about what is a successful student career. Eric Mann realized at a point in his life that he didn't feel he was getting what he needed out of life, so he began tracking his time spent in his life. 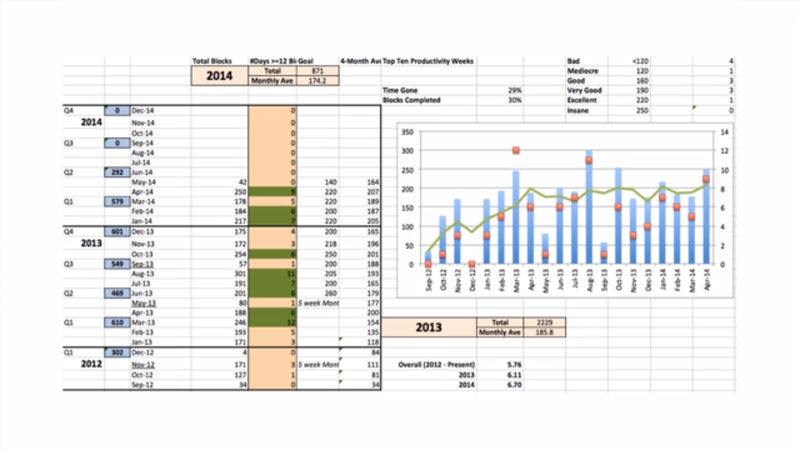 He pulled a bunch of data together from his calendars and put it into a spreadsheet to analyze. 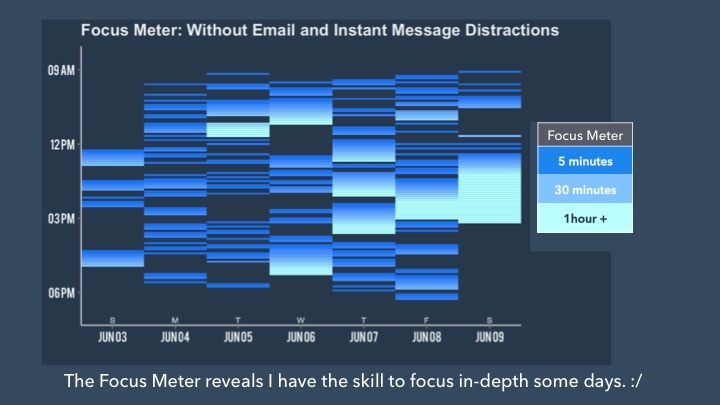 He then went a step further and built an app to visualize his data and also set goals so he can actually see if the time he is spending is working towards a goal or not. Kendra Albert talks about her book reading project, called "The Great Book Project of 2013." Her New Year's resolution last year was to read five books a week for nine months. She started this project because she wanted to change her reading habits. 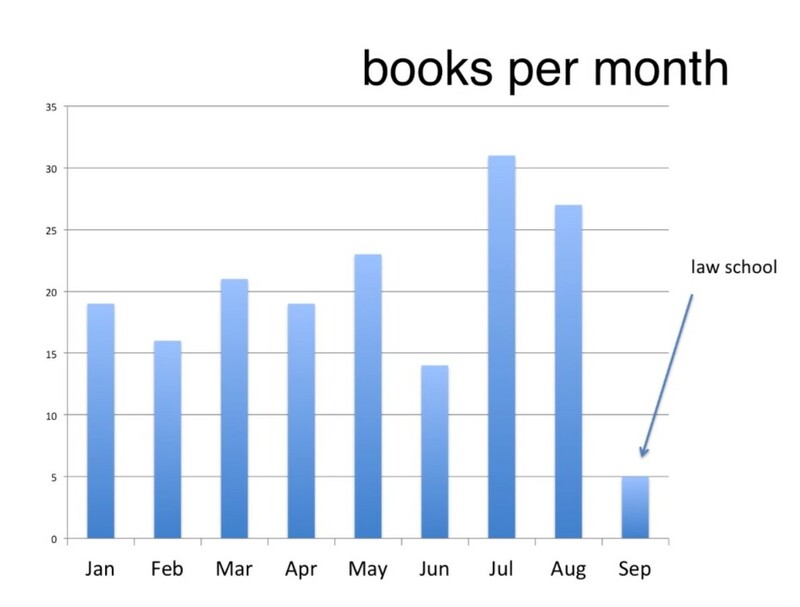 She shares her experience trying to read five books per week for nine months, and discusses the insights she has gained from the project. Buster Benson of Habit Labs likes to experiment with productivity, among other things. 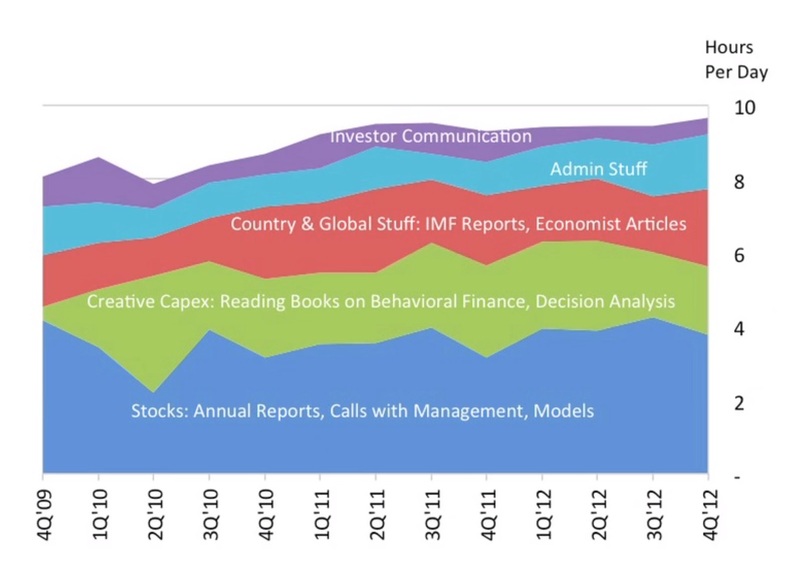 He uses RescueTime to see which apps and websites he spends the most time on each week. The winners are his text editor (for coding) and Gmail. 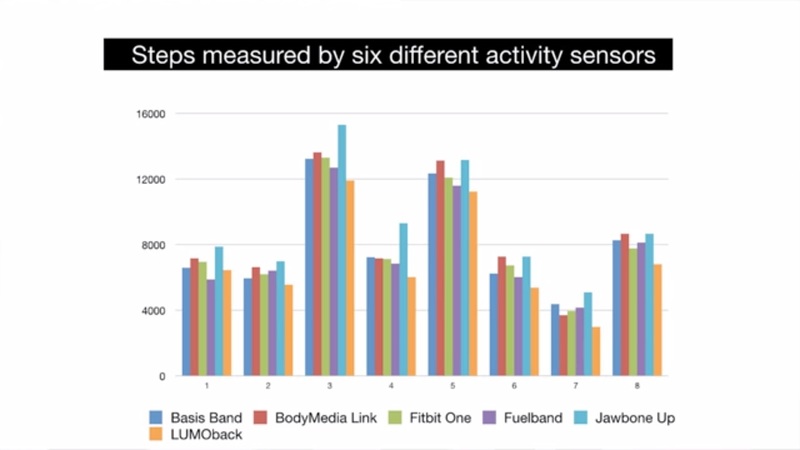 In the video, Buster talks about the ease of different kinds of tracking, from passive to binary to active entry, and previews some some Habit Labs apps. Denis Harscoat is a co-founder of Did This, an action logging tool. In this video, he talks about his interest in wanting to write a book and what he learned tracking his actions. In this talk, Andrew Paulus shares how he used self-tracking to measure the impact of weather on his choice of clothes. Andrew's morning habits included checking the weather on his phone in order to decide what to wear on that day. He then became curious about how efficient this process was, so he began tracking his choice of clothes and assessment at the end of the day. He shares his findings and process with the QS NY Meetup. 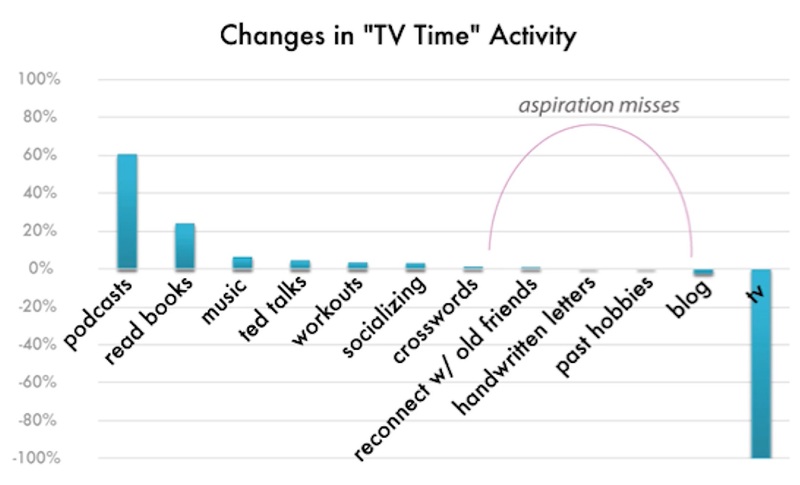 To make sure she is living by her priorities, Catherine Hooper has been tracking how she spends every hour of every day for the past 3 years. She defines her priorities, turns them into actions, then schedules them. Each week, Catherine sits down with her calendar, looks at what she already has on her schedule, and first decides whether these things fit within her priorities. After canceling any things that don’t fit, she adds in the actions that are important to her, in order of importance, as well as supporting actions that need to surround them. In this talk, she explains in details how she prioritize things and how she was able to say no to important things. Ryan Floyd moved to San Francisco three years ago. He manages an investment fund and invests in publicly listed stock in countries like like Bangladesh, Sri Lanka, Vietnam, Rwanda. About a year and a half after he started his fund, he decided to take on new investors, but didn't want to spend too much time on marketing. So, he broke his work time down in different intervals and started tracking. In this talk, Ryan talks about what he's learned from tracking his time for work. In this talk, Beau Gunderson shares a way to bring all of your disparate data sets, from Facebook to Twitter to Foursquare to Zeo to Fitbit to Runkeeper, together in one collection to be accessed through simple APIs. It’s part of an open source development effort called The Locker Project. The goal basically is to be able to see new patterns and correlation by bringing these sources of data together. Beau shares what he learned about himself and the different questions he has about his data. Laurie Dillon-Schalk is a twin and because of that she has always had a control sample. Laurie works in advertising and tracks all of her billable hours. In this talk, she discusses how she uses her billable hours data to gain better understanding of her work-life balance and build a strategy around that. Jamie got interested in tracking his time 15 years ago when he was a post-doc. He felt unproductive and decided to record the amount of time he was actually getting work done. Seeing the actual data gave him a sense of control but it became tedious so he stopped. 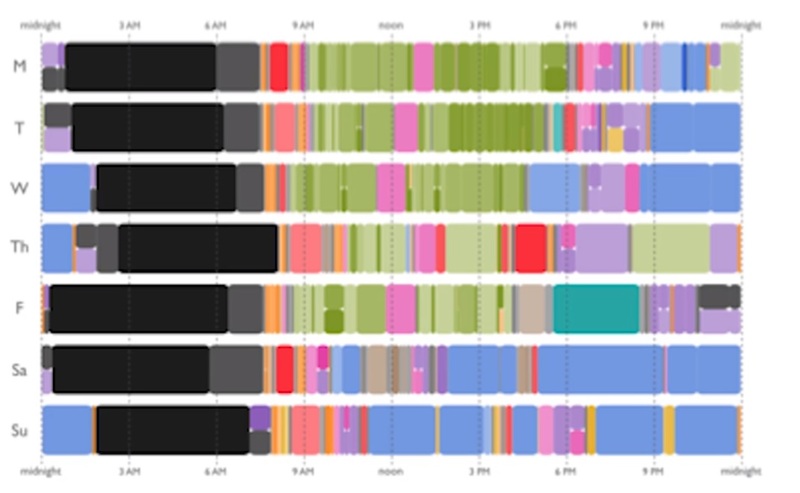 In this talk, he shares the project that he has been working on to visualize a timeline of his daily activities and explore his habits through data visualization. He also provides a background of how the project has evolved and what tools he has built to so far. Sebastien Le Tuan is a recovering "late-oholic." He is typically always late to friends and family events. One day he had a conversation with his dad that made him realize what effects his tardiness has on his personal and professional life. In this talk, Sebastien describes how he started tracking his punctuality and what he has learned from the process. Laurie Frick is a visual artist that make work, objects, and installations that relate to brain rhythm. 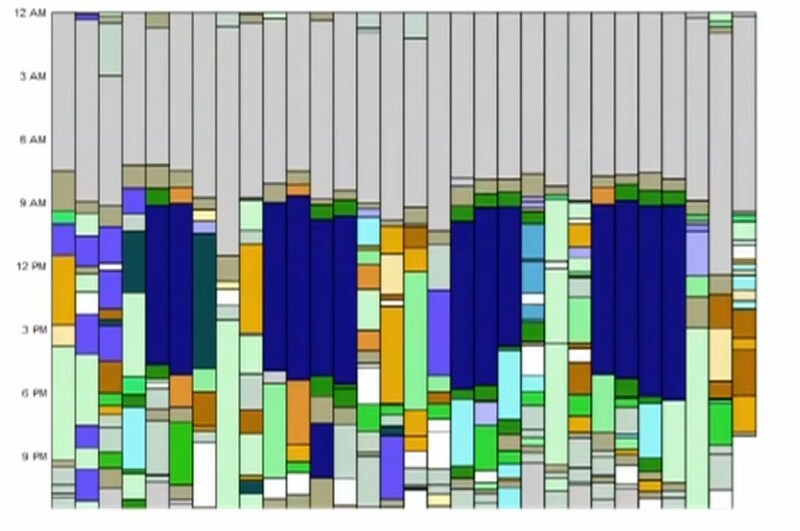 In the video, she presents her amazing work on daily activity charts and sleep charts translated to art. She measured her nightly sleep for over 3 years using a ZEO eeg headband and has almost 1000 nights of sleep data. 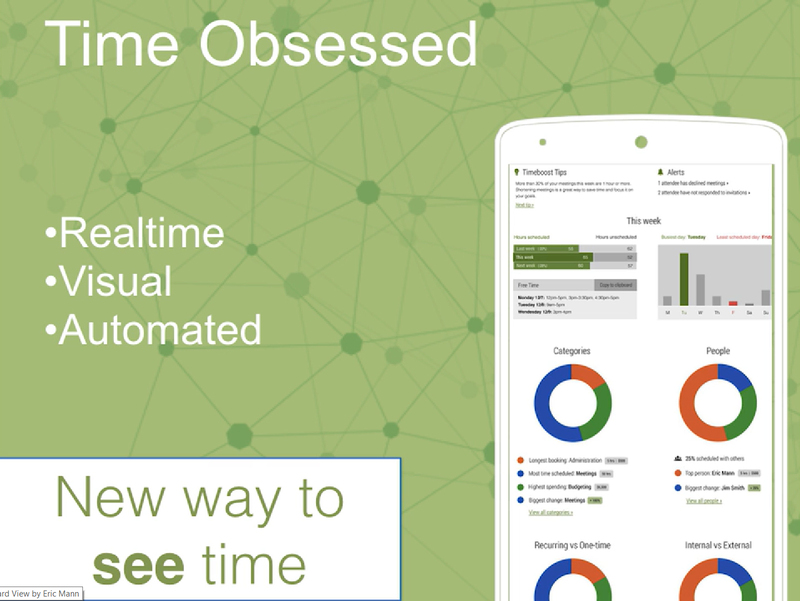 Eric Jain started Zenobase because he was getting fed up entering data into a dozen different, specialized tracking apps that never quite have the data fields he need, and using spreadsheets doesn't seem like much fun for him, either. Zenobase connects apps for time-tracking and self-tracking such as Foursquare, Moves, and FitBit and more. Joost studies Chemistry and loves working on experiments. In this video, he talk about some things that he discovered from doing all the tracking that he has done from his experiments. It’s about fitting mental models to a self-tracking life. During the last three years of tracking his food, activity and productivity, he noticed some things happening to his mind. It adapts. He shares his experience of his brain adaptation while tracking since tracking. Like many people, Christel de Maeyer felt that her sleep could be better. 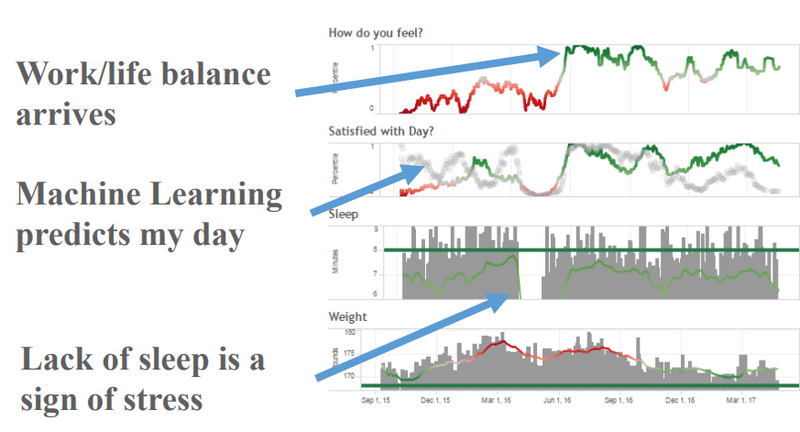 Presenting at our 2013 conference in Europe, Christel shares what she learned from collecting over three years of sleep data. Before self-tracking, Christel felt that she woke up frequently during the night, and the Zeo confirmed this. Jose Luis Santos present his experiment from the Catholic University. The intention of the experiment was to see how second year bachelor students self-manage their time, and self-manage also their group time because they are working in groups. Also they have to face some problems that they have, because they are using new technologies for them. The idea is that we visualize the behavior of the groups. At the end they have to be aware of their own activity and also ought to reflect on the visualization. While some people are using their data to help solve or, at least, alleviate seemingly intractable health issues, others are using their data to stave off issues before they occur. Daniel Rinehart talks about using sleep, happiness and biomarker data to keep himself in various “optimized zones” for his long-term health. In this talk, Mette Dyhrberg present “The Pomodoro Recovery”. Following the bouncing castle accident, Mette has been diagnosed with concussion and was recommended to rest and avoid using electronic devices in order to recover. She started tracking her symptoms, diet, and resting and working habits using Pomodoro method and Mymee app. The lack of progress has prompted her to look at her tracking data, after which she realized that she may have been misdiagnosed. Carlos Rizo tried to use different ways to hack his mindfulness practice using the law of doing less. He was trying to understand and change his behavior and use his password of his phone to get messages to his brain to create new habits. Richard Sprague covers a variety of new self-tracking devices, including Basis and Shine. The cool thing about Basis, it has an optical heart rate sensor unlike Fitbit. Shine is similar to a Fitbit only is designed to be really small and has an attractive industrial design. Rosa Delgado started tracking herself since 2009 - she tracks her financials, food, and goals. 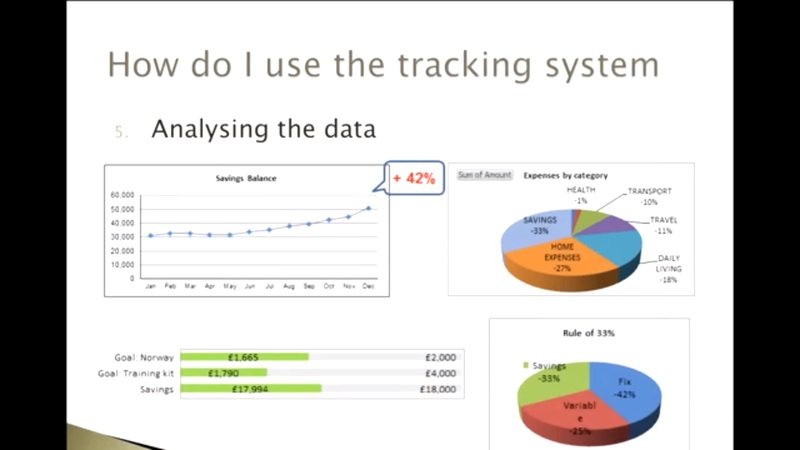 In this talk, Rosa talks about her success in taking control of her financial health by tracking it. Nick Crocker‘s QS journey started with his dentist telling him, “Floss the teeth you want to keep”. Nick tells the story of how he spent five years figuring out how to implement changes in his life, and how hard it was to add this habit to his routine. He also shares ten lessons he learned to make these changes easier. 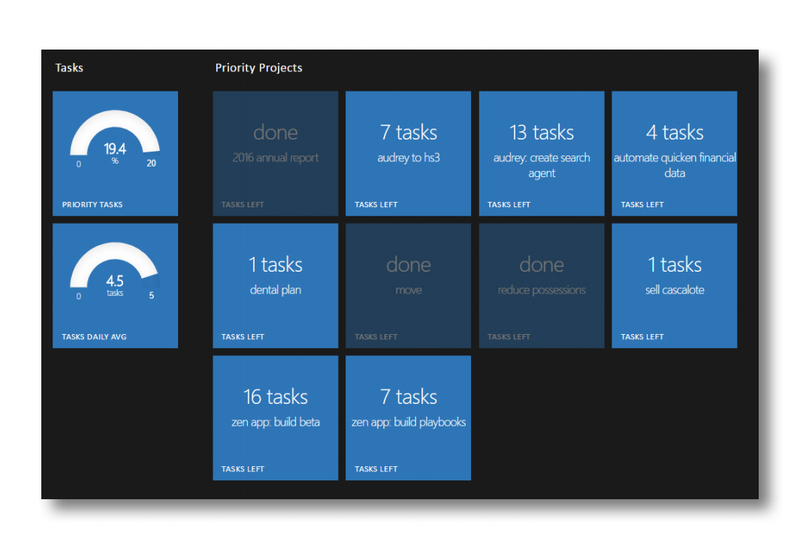 Sacha Chua discusses why it's worth it to build your own personal dashboard. She shares how simple it is and how it lets you track so many more things that companies might never get around to doing. In this video, she talks about her personal dashboard, www.quantifiedawesome.com and all the things she has been tracking; clothes, time, etc.. She built it using Ruby on Rails. Ellen de Lang-Ros helps small entrepreneurs build their business who like to use technology to improve their lives, or to have fun. In this video, she talks about how she used Lift to build her business and her spiritual life. Lift is easy-to-use, simple, with a customized dashboard app about uplifting yourself. Justin Foo, studied data analysis in school and at first wasn't interested in Quantified Self until he got started with Fitbit. 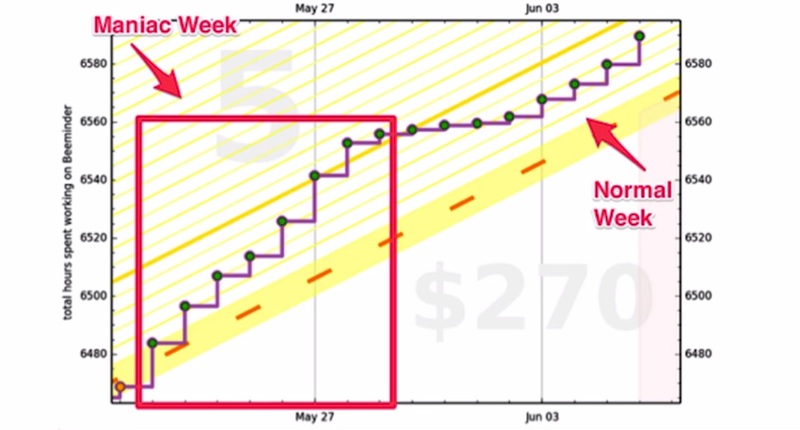 In this video, Justin discusses how he lost 40 pound by self-tracking with Fitbit. For 15 weeks, he used Fitbit to track his activity, his diet, and a little bit of his sleep. He shares what he did do, how he did it, and what he learned from it. Tiago teaches an online class which is an introduction to productivity philosophy and a method created by David Allen. 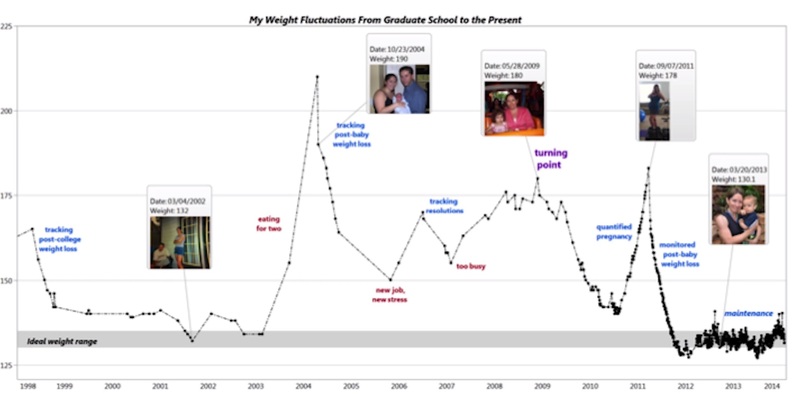 Tiago needed a way for him and his students to track changes in productivity over time. He was looking for a system that had to be simple, mobile, and does not require too much time for behavior change because it’s for beginners and needs to provide real insights. In this video he shares his learnings.